A good day in London with lots of sun and blue skies with lots of fluffy clouds. Just a few light rain showers. Good weather for black and white photography. I now have shots of the Tower of London, Shard, St Katherine’s Dock, Battersea Power Station and the Albert Bridge. I also have new shots of more familiar places like Tower Bridge and City Hall. Some of the Battersea Power Station images were thanks to the generous offer of Pippa, whom we met at an art show last year. Her apartment is right on the banks of the Thames with an unobstructed view. Perfect. 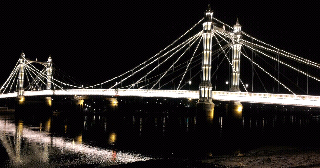 The attached photo is of the Albert Bridge at night. This is thought by many to be the prettiest bridge in London.